”No matter your situation, you have a choice. I chose joy.” Roxane Battle was on television for much of her adult life. As a news reporter and anchor, she traveled the world and met notable people from Jay Leno to Mariah Carey to Prince. But shortly after landing her dream job in her hometown of Minneapolis, Roxane’s marriage fell apart. Every day was a battle to keep it together on camera while piecing her life back together at home as the single mom of eleven-month-old Jarod. At one point, broke and alone, dinner was a single chicken McNugget. With wit, dignity, and gripping detail, Roxane shares her story of intentionally looking for joy during this challenging chapter of her life. Her faith was the guiding force as she searched for moments of gratitude and found a lifetime of grace. She also includes secrets to spiritual, professional, and personal wholeness for today’s woman, with chapters on authenticity, service, generosity, gratitude, self-care, yielding, forgiveness, and more. Battle has learned that joy is on the inside, regardless of circumstances. But we do not have joy by accident. She writes, “...we must be intentional about looking for and finding joy.” (138) In case we think she has not had to work at finding joy, she shares her own story of being a single mom, facing cuts in her career, and more. 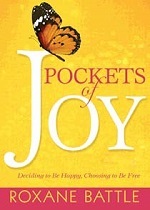 She gives practical steps to help us find joy daily. I like her chapter on authenticity and self acceptance. Her other steps include having positive connections with others and developing an attitude of gratitude, for example. Battle gives a somewhat detailed but very readable account of her life. The book can be a good encouragement and example to those who want to share their life experiences and the lessons they have learned from them. Her story is interesting and her suggestions very good. What this book is about is the season in my life when I was on my own and overwhelmed with trying to put my life back together while I learned how to raise a child and navigate a demanding television career. A working, divorced single mom. That was me. For years. There were many days when I smiled in front of the camera and cried alone at night. During those years, my time in the wilderness, I learned a lot about myself. I am now at a point when I am able, willing, and desire to share the very personal and intimate stories of how I found peace in the midst of my struggles. I discovered what I call pockets. Pockets of joy. The kind of joy that causes your eyes to mist and wash over the hurt. The kind of joy that catches you by surprise and for a moment makes you forget, if ever so briefly, that you ever felt pain. The kind of joy that, in some ways, cannot even be described. It is my hope and prayer my story will enable others to grasp a piece of the kind of joy I’m talking about and allow it to stir the kind of hope within that can renew and transform. 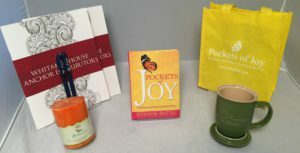 1st Place Package: Pockets of Joy, hard cover edition, “You Are An Amazing Woman” (Abbey Press) mug, and commemorative Whitaker House/Anchor Distributors coloring book. 2nd Place Package: Pockets of Joy, hard cover edition and commemorative Whitaker House/Anchor Distributors coloring book!